“I know my parents need help and I keep trying but they won’t even let me help them go to the doctor. Pop just says, 'I’ll think about it and let you know in a few days.' He’s been 'letting me know' for six months. There are two intervention "givens:"
The more help your mother needs, the more resistant she will be to accepting it. Appoint Healthcare Surrogate to act when your parent can no longer make decisions. Appoint Durable Power of Attorney to make legal/financial decisions if your parent is incapacitated. Add your name to your parent's bank and investment accounts so you have access to the funds for care if your parent becomes ill.
For all the above, it's best to consult a Trust & Estate or Elder Law attorney in the state where your parent resides. Providing transportation maintains Mom’s lifeline to food, doctors, and friends— all needed for independent living. Assisting with yard work, internal disrepair (loose tiles, burned out light bulbs), can help prevent accidents. Helping pay bills can prevent defaults on health/homeowners insurance and reduce exposure to exploitation and scams. Making extra portions of family dinners for Mom can help maintain her nutrition. A home care worker can help Mom maintain her hygiene and nutrition. 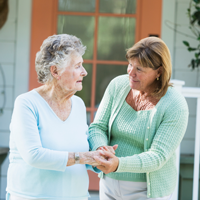 Gently explain to mom how accepting a little help now will help her remain independent in her home. If your parent is incapacitated (unable to make safe/sound decisions on her own behalf), contact a healthcare professional and an Elder Law attorney for guidance on Total Intervention. Log on to www.naela.org to find Board Certified Elder Law Attorneys. Do not intervene alone: ask for help from loved ones and professionals and always give yourself the credit you deserve for taking on this difficult job.